[Fig. 1] Direct action logo. From NRS 905 [5/7442 letter 16/40328, p.2]. [Fig. 2] Death threat. From NRS 905 [5/7439 letter 16/37674]. [Fig. 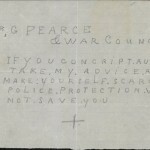 3] Death threat envelope. From NRS 905 [5/7439 letter 16/37674]. Much to the dismay of Hughes and Holman, the IWW continued to operate. However, Hughes increased the pressure on the organisation by introducing the Unlawful Associations Act, which named the IWW as an unlawful association and imposed a six month prison sentence on anyone associating with the organisation. (7) Many members were imprisoned as a result and some of the key players were then deported. (8) In addition, the War Precautions Act was also amended to prevent circulation of ‘Direct Action’. These measures combined to seal the nail in the coffin of the Sydney branch of the IWW. (1) Industrial Workers of the World. (n.d). Industrial Workers of the World – What Everyone Should Know, http://www.iww.org/culture/official/qanda, (accessed on 18 August 2015). (2) Barker, Tom & Fry, Tom Barker and the I.W.W., Australian Society for the Study of Labour History, Canberra, 1965, p. 19. (3) Beattie, Bill. ‘Memoirs of the I.W.W.’ Labour History, 13 (1967): 33-39, https://libcom.org/files/Memoirs%20of%20the%20I.W.W.pdf, (accessed 3 August 2015); Direct Action (10 August 1914). Issue No. 11, http://www.jura.org.au/files/jura/DirectAction-No11-10Aug1914_0.pdf. (4) Commonwealth of Australia, House of Representatives. (25 July 1917). Parliamentary Debates (Official Hansard) – Unlawful Associations Bill – Speech – Hughes, William Morris, http://parlinfo.aph.gov.au/parlInfo/genpdf/hansard80/hansardr80/1917-07-25/0101/hansard_frag.pdf;fileType=application%2Fpdf, (accessed 3 August, 2015); ‘Mr Hughes on the War’, The Australian Worker, 20 January 1916, p. 18, http://nla.gov.au/nla.news-page16650649. (5) State Archives New South Wales: Royal Commission on Inquiry into the matter of the trial and conviction and sentences imposed on Charles Reeve and others; NRS 1525, Printed report and minutes of evidence [4/7594]; Turner, Ian, Sydney’s Burning, London, Heinemann, 1969, pp. 204-211. (6) SANSW: Colonial Secretary; NRS 905, Letters received [5/7439] 16/37674, Report from Detective 1st Class N Moore. 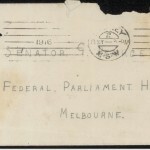 (7) Commonwealth of Australia, House of Representatives, 25 July 1917. (8) SANSW: State Penitentiary, Long Bay; NRS 2464, Entrance books, 18 June 1918, No. 2247 Tom Barker; SANSW: Albury Gaol; NRS 1966, Photographic description books [3/5999] 31 August 1917, Arthur Wyer.